Scenic view on the mountains covered with snow : nature, calm and large open spaces. Our comfortable deck-chairs are waiting for you for a relaxing day at the side of our outside pool with scenic view of the surrounding mountain chains. 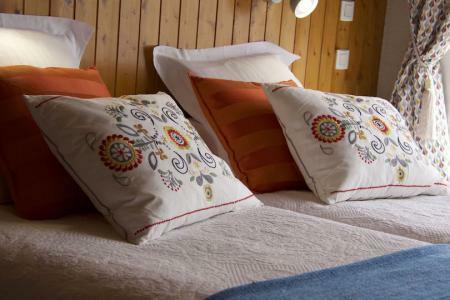 Our B&B "La Coustille" Offers you 5 comfortable and carefully decorated rooms. 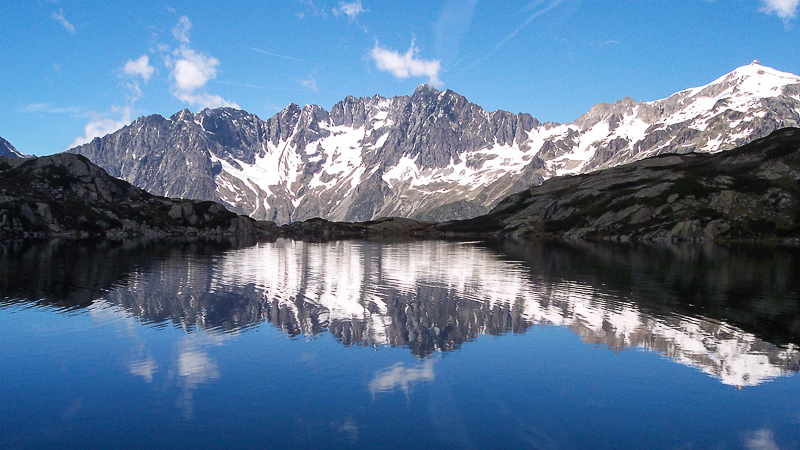 Take an inspiring hike towards one of the mountain lakes and take your time to admire their breathtaking beauty. The mountains treat you with beautiful panoramas! 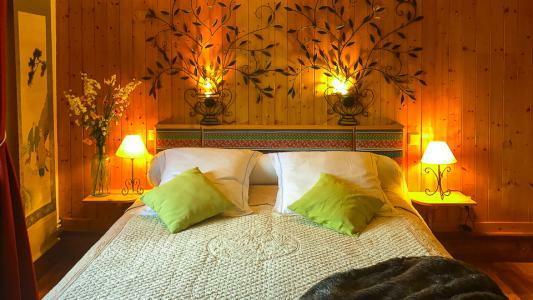 Discover the guest rooms of B&B La Coustille on the exceptional site of a small village, at 400 yards from the ski-resort (1200m / 2001m) in the Southern French Alpes, in a beautiful mountain range setting. St Leger Les Mélèzes is the gateway to the Ecrins National Park and 20 km from Gap. Throughout all saisons, we will provide personalized documentation, charts and information to help you choose among many activities. You will surely find the activity that fits your needs. « La Coustille », is the local translation of a small street that mounts ... La Coustille B&B, where you can live your vacation dreams. The guest rooms of La Coustille: quiet and cozy. "Aqui sian ben" : Here, I feel good (in local dialect). If you like quiet, rest, and nature, while being at the center of the ski resorts, hiking trails and sporting activities and places to visit, so choose one of our 5 rooms and your vacation will be successful. View our 5 bedrooms on the right side of the screen. Click on each room to visit the pictures, see our availability and book directly online. You can also see all at once on a single page, the availability of all our guest rooms by clicking on this link. 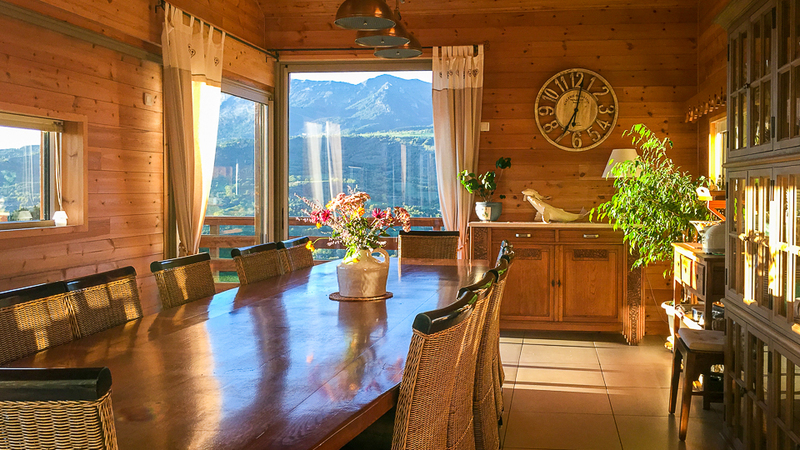 Our dining room offers a breathtaking panoramic view of the beautiful mountain range and its surrounding mountains of the valley at 180 ° but not only that, it also delights your « taste buds ». Exclusively reserved for our guests, our table will allow you to extend the moments of sharing and conviviality. This is an opportunity to share a family meal and taste delicious local and organic products. We offer affordable meal plans. Annie offers you a lively and exciting journey of authentic French cuisine sometimes embellished with exotic influences, dotted with discoveries she enjoys sharing. This is an opportunity to rediscover the famous "forgotten" vegetables and obsolete recipes and she reconciles today's children with dishes betrayed and ruined by their canteen at school. Annie restores "rustic" vegetables to their former glory! 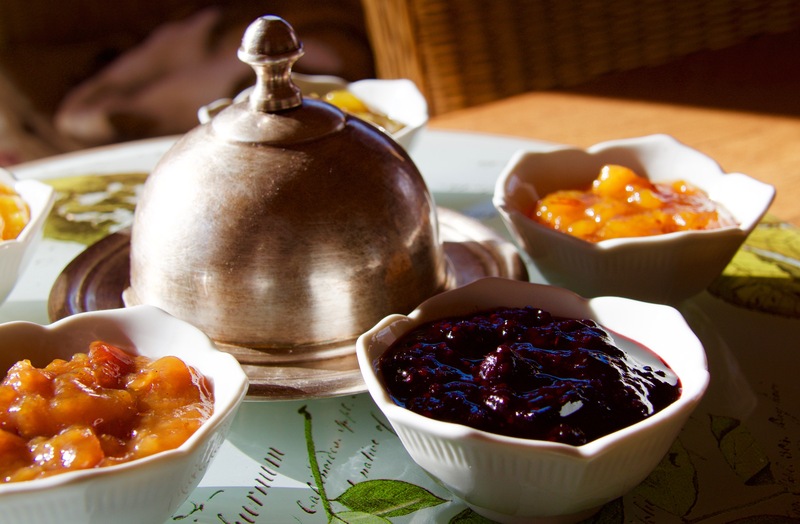 At the Host’s Table « La Coustille » we invest a lot in the « produced » and "cultivated" house jams, teas, syrups, fruits and vegetables, to uphold the authenticity of the taste and quality of our production we grow without the use of chemical pesticides. This philosophy is completely in line with our environment, our habitat, our home and ourselves. Breakfast and dinner, depending on season and time, are served in our dining room or under the arbor of the terrace. Meals at the guest table of the Coustille are composed of an entrée, a main-dish and its vegetables, salad, dessert or cheese and 1/4 of wine, cofee or tea. Prices for our meals: 29€ per adult and 17,50€ per child (2-11 years old). Babies free of charge (0-2 yeares old). No meals are served on Wednesdays and Sundays (june 1st september 30th) and Tuesdays and Sundays (october 1st - mai 31st). We will advise you on one of the excellent restaurants in our valley on those nights. We serve our evening meals when a minimum of 4 guests have reserved dinner the day before at the latest. We are serious about preserving the planet, work as much as possible with local producers and serve our home grown organic vegetables and fruits at our table. This video presents the different actors and their contribution to you. Come and see us to experience the delights of our environnement in person! We will guide you to discover natural outings accompanied or not in the surrounding area, our cocooning accommodations, local produces like:honey, cheeses and treasures of the hive being themselves the first products to benefit from the new brand. Earnings for the visitors? Respect and commitment to a local and organic way of working. Nature and culture, visitors will be delighted to reconcile the two, between discoveries of heritage and quality of local products. The ‘National Park spirit’ is the first step towards a successful stay! At the heart of the « Massif du Champsaur », you cut away from the world and take care of yourself by enjoying long walks in the fresh air, healthy, local produce and you resource in the sauna and jacuzzi before a massage provided in a warm atmosphere ... Everything is here to « log out from work »and give you a sense of harmony with nature. Discover a world apart where the wellness experience is total. Relaxing atmosphere of the spa guest house in « La Coustille » in the Hautes Alpes. We offer massage sessions (upon reservation) performed by qualified professionals providing comprehensive care tailored to each person. For more information and prices : please go to our page "Travel Tips" than "Our Relaxing Area And SPA". For more information, please to refer to the "Travel Tips » tab on the top of this page. 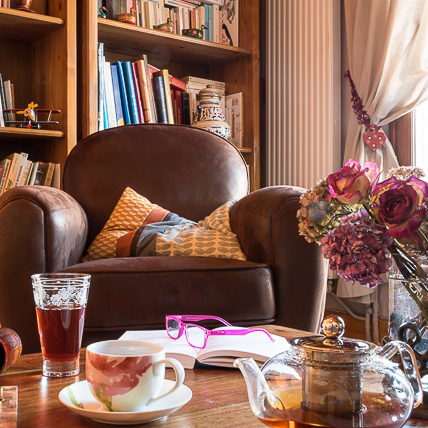 Why choose our B&B La Coustille ? Some advantages. 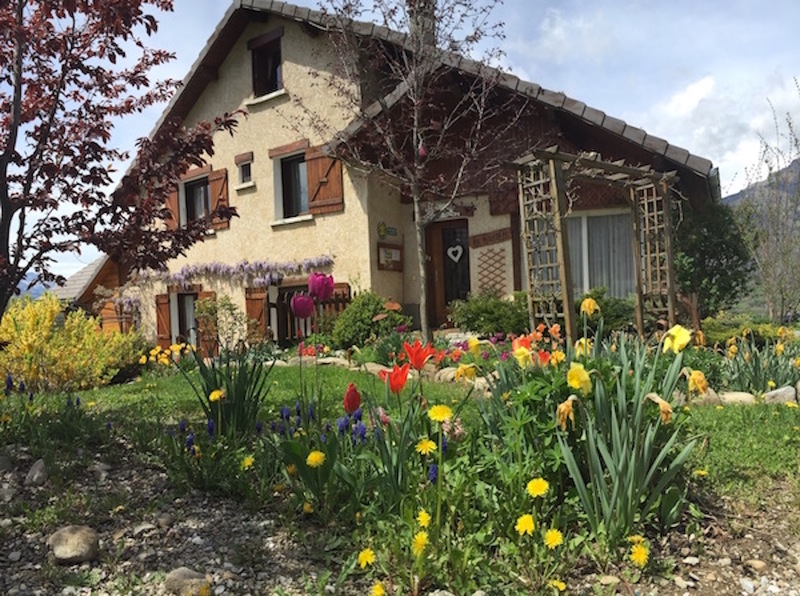 La Coustille in the Hautes Alpes in St Leger Les Mélèzes is the most beautiful in the region in an idyllic setting. Book directly on our site and stay in a beautiful and comfortable room. We offer several rooms, all cozy and comfortable. You will definitely find one that suits your needs and your budget. All rooms are strictly NON SMOKING. Smokers are welcome provided they indulge in their favorite pastime outside, respecting nature (we provide them with ashtrays). 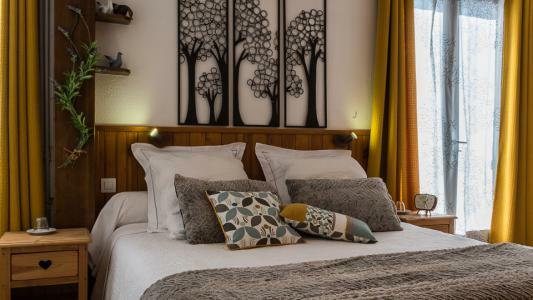 All rooms meet the prestigious label "3 Ears" by Gîtes de France and come with a private bathroom with shower and wc. Most rooms have a private terrace and direct access to the outside. Thanks to our professional reservation system online, you immediately see which rooms are available. In a few clicks you will know the price of your stay. The lowest prices are obtained for stays of 7 days or more. Season Deals possible. During the holyday season we hire for a stay of one week (7 nights). Shorter stays are possible, however if available or last minute, at any time, if the requested dates are immediately before or after an existing booking (see schedule online). You can book in advance, especially for the high season stays and periods of manifestations (Tour de France, Monte Carlo Rallye ...). We accept most credit cards, or cash. We offer free WIFI internet access in each room. From exciting activities to relaxing sorties, you find all near our chalet ; any season has it's specific charmes! 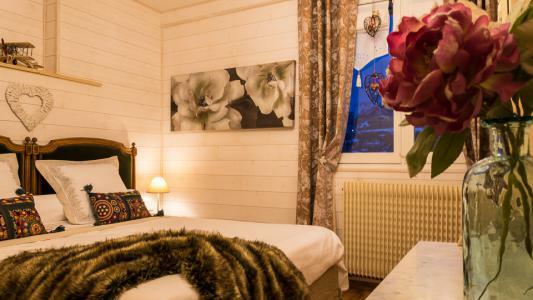 We are situated in the Ski Resort St Léger les Mélèzes, at only 400 m. from the ski lifts. You will find complete documentation and personalized advise for your cultural, sportive or relaxed outings. We have a well equipped SPA relaxation area that we reserve just for you in the winter, in summer you can profit from our outside pool with scenic view on the mountains. We prefer buying directly from local producers and use their bio products, or those grown in our own garden, for the preparation of a delicious family dinner to enjoy at our Guest Table with the other guests. We have three adorable cats ; therefore we cannot accept any domestic animals. St Léger les Mélèzes, the station with 3 labels: Green resort and snow village, tourist town, starry village and flower village.St Leger les Mélèzes: the "Mélèze" (Larch) is the emblematic tree of the mountain rangeAs a mountain tree, it grows between 1200 and 2400 m altitude.The Larch is the only conifer to lose its needles in the fall! As with hardwood its needles blush yellow and red and turn brown before falling. It is the only conifer in Europe to do so! Its name comes from a native of the Dauphine word « Mel »; meaning: Honey. Like most villages in the valley, the foundation of St Léger might lie around the year 1000. In the year 980, St Mayeul, Abbot of Cluny, (very important character of the church at the time) is stopped close to our village by the Saracens. It is during this period that the construction of castles begins. The village is still called « Le Serre » ( which means « small hill » in french) on top of which a fortified house was built. The castle of Saint-Léger is created by the monks of Cluny around the year 1200. It’s known to have housed members of the resistance during the last war. Listed as a historical monument in 1996, the castle and its surroundings are now protected to guarantee the respect for the integrity of the testimony of local history. In 1335 Saint-Léger counts only 77 families. The church was built in place of an old chapel and an old bell tower in 1870. From 1853 to 1899, about 2000 enumerated people left our beautiful "Champsaur"valley, etymologically "Champs d'Or" (Golden Fields), to go to North America (California, Louisianna), South America, Canada (Ottawa and Montreal), Australia (Sydney and Melbourne). Each year their offspring still come back to visit the area their ancesters lived in. The ski resort was created in 1966. In summer it’s as if you were in the Provence; the lavender scent around our pool and lively discussions in the petanque area! ... The Champsaur valley and the Ecrins National Parc will show you the return to pure Nature along its hiking trails on foot, on horseback, on a mountain bike or while paragliding! Lakes and rivers will cool you off! You do not like to move? That’s what the holidays are also good for, right?! Comfortable deckchairs await you at the pool. In the evening on the terrace by the barbecue, or in our dining room with panoramic view, come share our delightful dishes, combining mountain traditions and flavors of the south or elsewhere, for your delight. 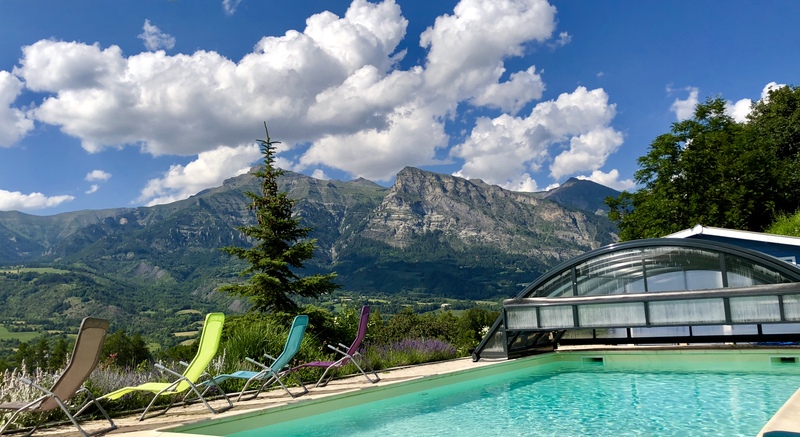 The guest house « La Coustille » and its pool, perfectly integrated in the beautiful landscape of the Hautes-Alpes. Autumn: the season when the mountain putts on its golden coat and rubies. In winter, with snow, you engage in the pleasures of skiing: downhill or cross country skiing, dog sledding, ice skating, ... or you hike on snowshoes in beautiful landscapes !! When you return, you will enjoy the wellness of our Spa area and relax in the Jacuzzi and Sauna before a massage or Shiatsu! Skiing and winter sports going downhill « tout schuss »! The resort of St Léger les Mélèzes has been equipped with new snow cannons and an artificial lake to feed them. Altitude of the resort 1260 mSki area: 1260 m to 2001 m.
Ski area consists of 16 slopes: 8 green, 2 blue, 5 red, 1 black. Activities: Alpine skiing, X-country Skiing, Snowshoeing, Sledding, Snow park, Dog sledding, Jöring skiing. Distance ro Resort center: 500 meters. Skiing school Distance: 500 meters. Skiset-hire shop Distance: 500 meters. 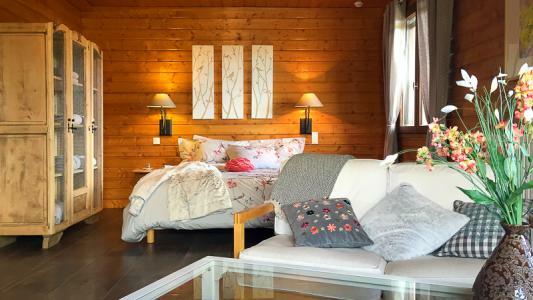 Ideally located at the edge of the village, close to all amenities, bars and restaurants, the B & B « La Coustille » will be the perfect « «pied-a-terre » for holidays in winter time with family or friends. Here, skiers will enjoy being next to the ski lifts and to have access to the slopes nearby. How beautiful the mountains are!... In any season enjoy the sauna and do not forget your bathing suit, in winter you can relax in the jacuzzi, in the summer in the outside heated pool. Between us and you, everything happens naturally, we will be complicit in your well being. Annie and Marcus Verhoeven Who are we? From Franco-Dutch origin, we received our first customers in 2003, in our guest rooms "Villa des Clematites" at the edge of the Champagne region east of Paris. 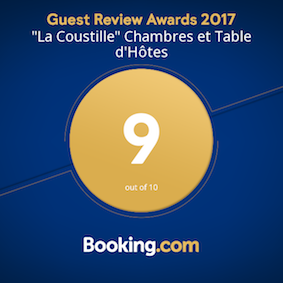 In early 2015, we fell in love with the B & B "La Coustille" in the beautiful Champsaur mountain range, in the Hautes Alpes. Our philosophy: Receive our guests like friends and make you feel at home with us; make you discover the surroundings with its multiple aspects. We like to "walk the extra mile" so our guests are comfortable with us...We are happy to welcome you home and share with you our passion for the Alps, nature, cooking, outdoor activities ... To make your stay pleasant, we offer you all the information on cultural or sports activities; the beautiful « Champsaur »Valley, The »Parc Des Ecrins" National Parc and its surroundings. We have two adorable cats, that's why we cannot accept any other cats or dogs in any of our rooms. If you are allergic to cats, please take your precautions! 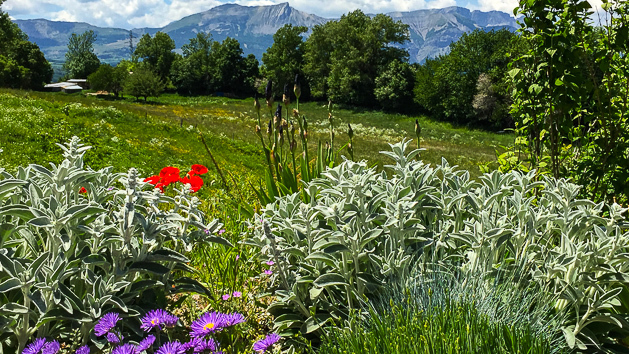 Charming wink to the Ecrins Nationl Park, with private terrace and vue on the village.